This is one of the very few kids movies that I haven't thouroughly enjoyed. I guess I had high expectations, because I remembered how I used to love watching Sesame Street each morning when I was just a little tike. Unfortunately, The Adventures of Elmo in Grouchland failed to bring back some of those feel-good memories of my youth. This phenomenon (or lack thereof) is mostly due to the fact that this movie only shows us a tiny portion of the familiar Sesame-Street scenery and characters. Most of the movie is set in, as you could probably guess, Grouchland - a whole other world filled with garbage and selfish grouchs. 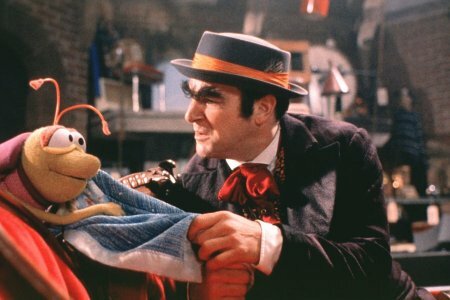 The grouchs (the race of muppets from which the familiar Oscar hails from) are kept in subversion by the bullious villian, Huxley (overacted by Mandy Patinkin). Below he is arguing with his assistant, Bug the bug. The primary struggle of our hero (the little, lovable, red monster named Elmo) is to recover from the villianous Huxley that which has been wrongfully and blatantly stolen. That which Elmo cannot go on living without. That which seems to give Elmo his sense of security in life and which aids him in sharing his joy with others. It is his blanket. Along the way, Elmo has to look within himself to find not only his courage to face the formidable Huxley, but also to discover his own shortcomings in the virtue of sharing. During his adventures, he also must pass the Queen of Trash (played beautifully by Vanessa Williams). Here he enlists the help of the audience in producing raspberries. This was one of the more enjoyable aspects of the film, that being how Elmo would every now and then talk to the audience. This was also done by Bert and Ernie who would periodically stop the film to discuss what was happening at the time. This was very cute. Unfortunately, the overacting by the humans and the trashy (pun intended) appearace of most of the scenery (yes, I know it is Grouchland, but it wasn't appealing to look at for an entire movie) made this one a forgettable one for me. The music was not that great to start with, but both Patinkin and Williams improved it with their good voices to the point of tolerability. I don't think that there is much there in this movie for adults, except for possibly some good discussion pieces to have with their children. However, the kids will probably love it, and that's all that matters anyway. Right? If you have kids, take them. It is always worth it to share a movie with a child. 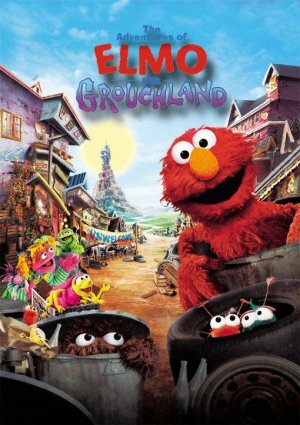 How would you rate the movie The Adventures of Elmo in Grouchland? There have been 11977 people to visit this page since Sun, Oct 10, 1999. And you are the first person to visit this page today!